One of the most beautiful aspects of tennis is the fact that it continues to evolve. The rules may be the same, but the pace and rhythm are different. Agility is key. The game today is not only about hitting the ball, but also about shaving valuable seconds off the time it takes to get from one side of the court to the other. Players are constantly on the move, on a variety of surfaces, so a superlight, streamlined shoe is essential to keep up with the new, faster pace of the category. The Wave Impulse is the latest shoe in Mizuno tennis footwear range, and it’s built for speed. Just like a running shoe, the Wave impulse has a flexible sole that offers full contact with the ground to provide a smooth and dynamic roll-off. 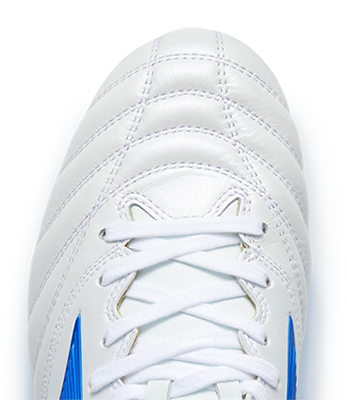 Stability is also guaranteed thanks to the action of the Mizuno Wave; our unique technology ensures optimal strength when impacting the ball. The upper design of the Wave Impulse is all about combining the elements of lightness and comfort, both required for a shoe that is to improve agility on the court. First class comfort is provided by the bootie construction. In the forefoot we added synthetic leather so you are able to deal with the harder conditions of tennis. while the heel area is more textile based to make the shoe lighter and faster. The design is inspired by sports cars. These performance vehicles are typically light and agile, but also protected for tougher conditions. The Mizuno Wave helps to keep the ankle in the correct position, providing stability. This is vital for quick sidestep movement and a strong impact on the ball. Furthermore the Wave plate also make the landing softer and maximizes the energy return, working to the advantage of the a player with a lot of movement. With the sole being flat, making contact with the ground throughout the foot, and flexibility in the forefoot, you will find it easier to move around freely all over the court. With more weight put on the heel, to give extra support to the rearfoot, an AP+ heel wedge has been added.